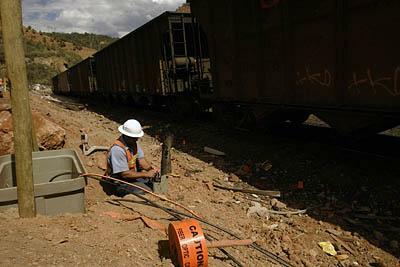 As a Union Pacific train goes by on the recently repaired railway, Centracom employee Pat Coates on Friday repairs phone and fiber-optic cables that were damaged after a truck with explosives blew up a 30-by-70-foot hole in U.S. Highway 6 on Wednesday afternoon. 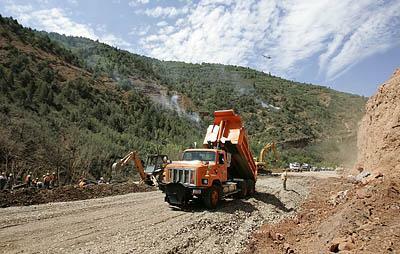 A Utah Department of Transportation truck dumps a load of crushed rock on a section of U.S. Highway 6 in Spanish Fork Canyon on Thursday, a day after a tractor-trailer carrying explosives overturned and exploded, tearing out a deep crater in the road. The investigation into the tractor-trailer rollover that set off 35,500 pounds of high explosives on a stretch of U.S. 6, blasting a huge crater in the road and sending at least 20 to the hospital, is pointing directly at the truck driver, officials said Thursday. Public safety officials are alleging Travis Stewart, 30, of Rexburg, Idaho, careened off the highway because he was going too fast. And they want his company, R&R Trucking Inc., to compensate the state of Utah for the hundreds of thousands of dollars it is costing to rebuild the destroyed road. "This is a curve notorious for accidents. This trucker wasn't traveling at the posted speed limit," said Brent Wilhite, a spokesman for the Utah Department of Transportation. "There needs to be some accountability here." Lt. Ken Peay, the Utah Highway Patrol commander for Utah County, said the truck was traveling east up a hill about 60 miles southeast of Salt Lake City, when the driver swerved out of control and hit the shoulder concrete barrier, which ripped open the truck's fuel tank and spilled pallets of explosives. "They just get going up the hill too fast," Peay said. "It's posted at 40 [miles per hour] and anything much over that, the radius of the curve just takes it over the side." Stewart and his co-driver, Troy Lysfjord, 37, of Blackfoot, Idaho, who said they had been through the canyon several times and were familiar with its dangers, were hauling 17 pallets with 40 explosive devices per pallet. Each device was a cylinder 29 1/2 inches long and 2 to 3 inches in diameter, coated in orange plastic, Peay said. The pair were on their way from Ensign-Bickford Co. in Spanish Fork to Oklahoma when the truck tipped on its right side and tore open just before 2 p.m. The two men told investigators they saw flames coming from the rear of the tractor and ran from the truck. They said they shouted at other travelers and bystanders to get out of the area. Three minutes after the wreck, the explosives blew all at once. The force of the blast vaporized the truck, tore chunks out of the canyon wall, set more than a dozen fires and gouged a 30-foot-deep hole in the highway. The explosion shoved aside the Union Pacific rail line 50 feet from the highway and blew the sunglasses off bewildered landscapers working on the roadside 10 miles away, officials said. Area hospitals confirmed 20 people were either taken to hospitals or went on their own for treatment. Some victims had shrapnel wounds or injuries resulting from the blast's concussion. Other bystanders complained of problems with their hearing. The last victims were expected to be discharged Thursday night. Art Regoli, a trucker from West Valley City, was both a witness and victim. Regoli, 42, who spent four years as an artilleryman for the U.S. Marine Corps, said nothing he witnessed during his service compared to what he saw Wednesday. He was driving a tractor with an empty trailer to Salt Lake City from Parachute, Colo., when the blast blew in his truck windows, pushed in his doors and covered him in blood. Just seconds earlier he was parked behind a few cars and another truck as bystanders helped pull Stewart and Lysfjord from their truck. Regoli said he saw the cars in front of him turn around. He saw the two men approach him, then felt the concussion and the heat. He woke up on the floor of his truck. He is unsure how long he was unconscious. The blast sent slivers of glass into his head, face and body. Wildfires on the canyon walls seemed to surround him with flames and smoke. Shrapnel littered the ground. "There were chunks as big as my hand of sharp-edged metal and steel," Regoli said. "Can you imagine one of those coming through your windshield?" Taken by helicopter to LDS Hospital in Salt Lake City, Regoli was discharged Wednesday night. The concussion bruised his chest and he was still having trouble breathing on Thursday, but he said he planned to return to work today. Meanwhile, UDOT, the U.S. Forest Service and the railroads put everything back together again. Twenty-five highway workers toiled around the clock, hauling 350 loads of road base material in snowplow trucks - minus their blades - to the site. It took 4,500 tons of material to fill and resurface the road, said UDOT spokesman Nile Easton. The crews first had to pry several 5-foot-diameter boulders from the hillside after public safety officials gathered up unexploded ordnance that flew up the hill along with the truck. UDOT crews scoured the area for cracks and fissures. Forest Service firefighters fought stubborn brush blazes. By 6 p.m. Thursday, road crews were pouring asphalt, Easton said. UDOT expects the road to be reopened today. Brent Wilhite, another UDOT spokesman, said members of the Utah County Sheriff's bomb squad determined the explosives - seismic devices used in oil and gas drilling - weren't volatile. A tanker fire in 2001 on Interstate 15 near 10600 South in Sandy melted the freeway, and earlier this year a tanker exploded near Kaysville on U.S. 89, but the only UDOT disaster that approached Wednesday's was when floods wiped out the town of Thistle and Highway 23 in the spring of 1983, Easton said. The repair work could cost $400,000. UDOT will seek compensation from R&R Trucking's insurance company, he said. R&R officials did not return repeated telephone calls Thursday. Union Pacific dispatched 150 people from Salt Lake City on Wednesday night and had one section of track open early Thursday morning and the second opened Thursday afternoon, said UP spokesman Mark Davis. UP runs an average of 12 freight trains per day on the line through Spanish Fork Canyon; six trains were delayed during the repairs, he said. The explosion shoved the tracks sideways and covered them with mud and asphalt debris, Davis said. A crane mounted on a track vehicle lifted the tracks back into place, then crews used a laser to realign them. The company had no preliminary estimate of what the repairs cost, but wasted no time getting the trains running again, Davis said. "The rail industry practices this type of response, day in and day out. It's very important to a lot of our corridors to have minimal delay," he said. "It affects the national economy." Marc Migliari, an Amtrak spokesman based in Chicago, said westbound passengers on the California Zephyr, which was delayed at least 19 hours, were offered the option of taking buses. The eastbound train was detoured through Wyoming. Passengers to Provo, Helper, Green River and Colorado cities between Green River and Denver were bused to their destinations. Wilhite said UDOT has spent $100 million in the past five years to make U.S. 6 safer. "We've probably added 40 signs in that area, even adding flashing lights to the signs for night conditions," he said. UDOT, which wants to overhaul the entire length of the highway connecting Price with Spanish Fork, has upgraded the section that passes through Spanish Fork Canyon, adding passing lanes, widening bridges and shoulders, installing center line and shoulder rumble strips and straightening curves. "We've done everything we can short of getting in people's cars and driving them ourselves to make this section safer," Wilhite said. Still, he said, "any time there's a road that travels through mountains, there's going to be curves, that's just the nature of the roads." Nevertheless, drivers continue to drive carelessly around mile marker 191, where Wednesday's crash occurred. Wilhite said that since 2002, at least 64 vehicles have wrecked within two miles of that curve. Easton said he hiked 200 yards north of the wreck site and found 25-pound hunks of asphalt littering the hillside. It's amazing no one was killed, he said. The last thing UDOT will do in the repair is replace the concrete jersey barrier on the roadside so rubberneckers trying to get a look at where the crater once was won't drive off the road. "We're hoping people will pay attention to driving through here," Easton said.